Edward St. John Gorey (February 22, 1925 – April 15, 2000) was an American writer and artist noted for his illustrated books. His characteristic pen-and-ink drawings often depict vaguely unsettling narrative scenes in Victorian and Edwardian settings. Cape Cod Hospital, Hyannis, Massachusetts, U.S. The Gashlycrumb Tinies, The Doubtful Guest, Mystery! Edward St. John Gorey was born in Chicago. His parents, Helen Dunham (née Garvey) and Edward Lee Gorey, divorced in 1936 when he was 11, then remarried in 1952 when he was 27. One of his stepmothers was Corinna Mura (1909–1965), a cabaret singer who had a small role in the classic film Casablanca as the woman playing the guitar while singing "La Marseillaise" at Rick's Café Américain. His father was briefly a journalist. Gorey's maternal great-grandmother, Helen St. John Garvey, was a popular nineteenth-century greeting card writer and artist, from whom he claimed to have inherited his talents. Gorey attended a variety of local grade schools and then the Francis W. Parker School. He spent 1944 to 1946 in the Army at Dugway Proving Ground in Utah. He then attended Harvard University, beginning in 1946 and graduating in the class of 1950; he studied French and roomed with poet Frank O'Hara. In the early 1950s, Gorey, with a group of recent Harvard alumni including Alison Lurie (1947), John Ashbery (1949), Donald Hall (1951) and O'Hara (1950), amongst others, founded the Poets' Theatre in Cambridge, which was supported by Harvard faculty members John Ciardi and Thornton Wilder. He frequently stated that his formal art training was "negligible"; Gorey studied art for one semester at the School of the Art Institute of Chicago in 1943. From 1953 to 1960, he lived in Manhattan and worked for the Art Department of Doubleday Anchor, illustrating book covers and in some cases, adding illustrations to the text. He illustrated works as diverse as Bram Stoker's Dracula, H. G. Wells' The War of the Worlds and T. S. Eliot's Old Possum's Book of Practical Cats. In later years he produced cover illustrations and interior artwork for many children's books by John Bellairs, as well as books begun by Bellairs and continued by Brad Strickland after Bellairs' death. His first independent work, The Unstrung Harp, was published in 1953. He also published under various pen names, some of which were anagrams of his first and last names, such as Ogdred Weary, Dogear Wryde, Ms. Regera Dowdy, and dozens more. His books also feature the names Eduard Blutig ("Edward Gory"), a German-language pun on his own name, and O. Müde (German for O. Weary). The New York Times credits bookstore owner Andreas Brown and his store, the Gotham Book Mart, with launching Gorey's career: "it became the central clearing house for Mr. Gorey, presenting exhibitions of his work in the store's gallery and eventually turning him into an international celebrity." Gorey's illustrated (and sometimes wordless) books, with their vaguely ominous air and ostensibly Victorian and Edwardian settings, have long had a cult following. He made a notable impact on the world of theater with his designs for the 1977 Broadway revival of Dracula, for which he won the Tony Award for Best Costume Design and was nominated for the Tony Award for Best Scenic Design. In 1980, Gorey became particularly well known for his animated introduction to the PBS series Mystery! In the introduction of each Mystery! episode, host Vincent Price would welcome viewers to "Gorey Mansion". Because of the settings and style of Gorey's work, many people have assumed he was British; in fact, he only left the U.S. once, for a visit to the Scottish Hebrides. In later years, he lived year-round in Yarmouth Port, Massachusetts, on Cape Cod, where he wrote and directed numerous evening-length entertainments, often featuring his own papier-mâché puppets, an ensemble known as Le Theatricule Stoique. The first of these productions, Lost Shoelaces, premiered in Woods Hole, Massachusetts on August 13, 1987. The last was The White Canoe: an Opera Seria for Hand Puppets, for which Gorey wrote the libretto, with a score by the composer Daniel James Wolf. Based on Thomas Moore's poem The Lake of the Dismal Swamp, the opera was staged after Gorey's death and directed by his friend, neighbor, and longtime collaborator Carol Verburg, with a puppet stage made by his friends and neighbors, the noted set designers Herbert Senn and Helen Pond. 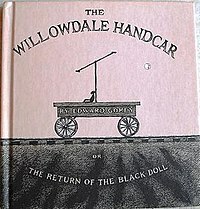 In the early 1970s, Gorey wrote an unproduced screenplay for a silent film, The Black Doll. After Gorey's death, one of his executors, Andreas Brown, turned up a large cache of unpublished work complete and incomplete. Brown described the find as "ample material for many future books and for plays based on his work". I'm neither one thing nor the other particularly. I am fortunate in that I am apparently reasonably undersexed or something ... I've never said that I was gay and I've never said that I wasn't ... what I'm trying to say is that I am a person before I am anything else ... Well, I’m neither one thing nor the other particularly. I suppose I’m gay. But I don’t identify with it much. Edward Gorey agreed in an interview that the "sexlessness" of his works was a product of his asexuality. From 1995 to his death in April 2000, the normally reclusive artist was the subject of a cinéma vérité-style documentary directed by Christopher Seufert. (As of 2016, the film has been screened as a work-in-progress; the finished film and accompanying book are in post-production.) He was interviewed on Tribute to Edward Gorey, an hour-long community, public-access television cable show produced by artist and friend Joyce Kenney. He contributed his videos and personal thoughts. Gorey served as a judge at Yarmouth art shows and enjoyed activities at the local cable station, studying computer art and serving as cameraman on many Yarmouth shows. 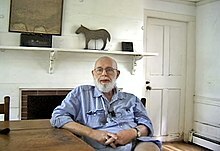 His Cape Cod house is called Elephant House and is the subject of a photography book entitled Elephant House: Or, the Home of Edward Gorey, with photographs and text by Kevin McDermott. The house is now the Edward Gorey House Museum. Gorey left the bulk of his estate to a charitable trust benefiting cats and dogs, as well as other species, including bats and insects. Gorey is typically described as an illustrator. His books may be found in the humor and cartoon sections of major bookstores, but books such as The Object Lesson have earned serious critical respect as works of surrealist art. His experimentation—creating books that were wordless, books that were literally matchbox-sized, pop-up books, books entirely populated by inanimate objects—complicates matters still further. As Gorey told Lisa Solod of The Boston Globe, "Ideally, if anything were any good, it would be indescribable." Gorey classified his own work as literary nonsense, the genre made most famous by Lewis Carroll and Edward Lear. In response to being called gothic, he stated, "If you're doing nonsense it has to be rather awful, because there'd be no point. I'm trying to think if there's sunny nonsense. Sunny, funny nonsense for children—oh, how boring, boring, boring. As Schubert said, there is no happy music. And that's true, there really isn't. And there's probably no happy nonsense, either." Many of Gorey's works were published obscurely and are difficult to find (and priced accordingly), however, the following four omnibus editions collect much of his material. Because his original books are rather short, these editions may contain 15 or more in each volume. He also illustrated more than 50 works by other authors, including Samuel Beckett, Edward Lear, John Bellairs, H. G. Wells, Alain-Fournier, Charles Dickens, T. S. Eliot, Hilaire Belloc (where new illustrations to Cautionary Tales for Children were published posthumously), Muriel Spark, Florence Parry Heide, John Updike, John Ciardi and Felicia Lamport. Gorey was very fond of word games, particularly anagrams. He wrote many of his books under pseudonyms that usually were anagrams of his own name (most famously Ogdred Weary). Some of these are listed below, with the corresponding book title(s). Eduard Blutig is also a word game: "Blutig" is German (the language from which these two books purportedly were translated) for "bloody" or "gory". D. Awdrey-Gore – The Toastrack Enigma, The Blancmange Tragedy, The Postcard Mystery, The Pincushion Affair, The Toothpaste Murder, The Dustwrapper Secret and The Teacosy Crime (Note: These books, although attributed to Awdrey-Gore in Gorey's book The Awdrey-Gore Legacy, were not really written). She is a parody of Agatha Christie. Dewda Yorger – "The Deary Rewdgo Series for Intrepid Young Ladies (D.R. on the Great Divide, D.R. in the Yukon, D.R. at Baffin Bay, etc.)" Gorey has become an iconic figure in the goth subculture. Events themed on his works and decorated in his characteristic style are common in the more Victorian-styled elements of the subculture, notably the Edwardian costume balls held annually in San Francisco and Los Angeles, which include performances based on his works. The "Edwardian" in this case refers less to the Edwardian period of history than to Gorey, whose characters are depicted as wearing fashion styles ranging from those of the mid-nineteenth century to the 1930s. Director Mark Romanek's music video for the Nine Inch Nails song "The Perfect Drug" was designed specifically to resemble a Gorey book, with familiar Gorey elements including oversized urns, topiary plants and glum, pale characters in full Edwardian costume. Also, Caitlín R. Kiernan has published a short story entitled "A Story for Edward Gorey" (Tales of Pain and Wonder, 2000), which features Gorey's black doll. A more direct link to Gorey's influence on the music world is evident in The Gorey End, an album recorded in 2003 by The Tiger Lillies and the Kronos Quartet. This album was a collaboration with Gorey, who liked previous work by The Tiger Lillies so much that he sent them a large box of his unpublished works, which were then adapted and turned into songs. Gorey died before hearing the finished album. In 1976, jazz composer Michael Mantler recorded an album called The Hapless Child (Watt/ECM) with Robert Wyatt, Terje Rypdal, Carla Bley, and Jack DeJohnette. It contains musical adaptations of The Sinking Spell, The Object Lesson, The Insect God, The Doubtful Guest, The Remembered Visit, and The Hapless Child. The last three songs also have been published on his 1987 Live album with Jack Bruce, Rick Fenn, and Nick Mason. The opening titles of the PBS series Mystery! are based on Gorey's art, in an animated sequence co-directed by Derek Lamb. 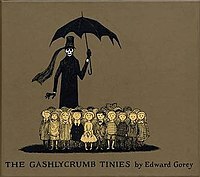 In the last few decades of his life, Gorey merchandise became quite popular, with stuffed dolls, cups, stickers, posters, and other items available at malls around the United States. In 2007, The Jim Henson Company announced plans to produce a feature film based on The Doubtful Guest to be directed by Brad Peyton. No release date was given and there has been no further information since the announcement. The online journal Goreyesque publishes artwork, stories, and poems in the spirit of Edward Gorey's work. The journal is co-sponsored by the Department of Creative Writing at Columbia College Chicago and Loyola University Chicago. Goreyesque was launched in tandem with the Chicago debut of two Gorey collections: Elegant Enigmas: The Art of Edward Gorey and G is for Gorey. The collections were shown at the Loyola University Museum of Art (LUMA) in Chicago, Illinois from February 15 to June 15, 2014. Goreyesque features the work of both emerging talents and seasoned professionals, such as writers Sam Weller and Joe Meno. ^ Kelley, Tina (April 16, 2000). "Edward Gorey, Eerie Illustrator And Writer, 75". The New York Times. ^ Reitwiesner, William Addams. "Ancestry of Edward Gorey". www.wargs.com. ^ Gussow, Mel (April 17, 2000). "Edward Gorey, Artist and Author Who Turned the Macabre into a Career, Dies at 75". The New York Times. ^ a b "The Data File: Gorey Discoveries", Locus, December 2000, p.11. ^ Gottlieb, Robert (December 31, 2018). "Superb Oddities: Robert Gottlieb Reviews a Biography of Edward Gorey". The New York Times. ^ Dery, Mark (November 6, 2018). Born to Be Posthumous: The Eccentric Life and Mysterious Genius of Edward Gorey. Little, Brown and Company. p. 14. ISBN 978-0316188548. ^ Schiff, Stephen. "Edward Gorey and the Tao of Nonsense." The New Yorker, November 9, 1992: 84–94, p. 89. ^ Dery, Mark (2018-11-14). "The Birth, Death, and Long Afterlife of Edward Gorey's Gashlycrumb Tinies". Slate Magazine. Retrieved 18 November 2018. ^ a b "Gorey Games". abebooks.co.uk. Retrieved November 22, 2018. ^ Gorey, Edward (1993). Amphigorey Also – Edward Gorey. ISBN 978-0156056724. Retrieved February 22, 2013. ^ Interview with Mark Romanek, in the currently unreleased documentary by Christopher Seufert. ^ Kogan, Rick. "Step inside Edward Gorey's weird, beautiful world". Chicago Tribune. Retrieved 11 April 2015. ^ Chavez, Danette. "Goreyesque Wants Your Edward Gorey-Inspired Writing and Artwork". gapersblock.com. Retrieved 11 April 2015. ^ "Goreyesque About". Goreyesque.com. Retrieved 11 April 2015. ^ "Call for submissions: Columbia College Chicago's Department of Creative Writing seeks Goreyesque work". ChicagoNow. Retrieved 11 April 2015. ^ "Selling to CTA riders, veterinary house calls and another Tea2Go". Crain's Chicago Business. 2014-02-25. Retrieved 11 April 2015. ^ "Goreyesque Issue 3". Goreyesque.com. Retrieved 11 April 2015. ^ "Goreyesque Issue 1". Goreyesque.com. Retrieved 11 April 2015. G Is For Gorey--C Is for Chicago; The Collection of Thomas Michalak. libguides.luc.edu. The World of Edward Gorey, Clifford Ross and Karen Wilkin, Henry N. Abrams Inc., 1996 (ISBN 0-8109-3988-6). Interview and monograph. The Strange Case of Edward Gorey, Alexander Theroux, Fantagraphics Books, 2000 (ISBN 1-56097-385-4). Biography and reminiscence by Theroux, a friend of Gorey. An expanded edition was published in 2011 (ISBN 978-1-60699-384-2). The Gorey Details. BBC Radio program compiled and presented by Philip Glassborow, including interviews with Andreas Brown of the Gotham Book Mart, actor Frank Langella (star of Gorey's Dracula on Broadway), Alison Lurie, Alex Hand, Jack Braginton Smith, Katherine Kellgren, and featuring David Suchet as the voice of Gorey. "All The Gorey Details", The Independent, by Philip Glassborow, May 2003. Born to Be Posthumous: The Eccentric Life and Mysterious Genius of Edward Gorey, Mark Dery, Little, Brown, 2018 (ISBN 978-0-316-18854-8).